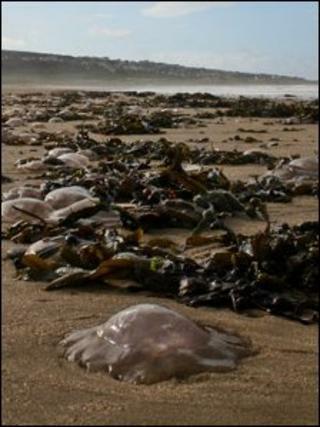 A south Wales beach used to film scenes for Doctor Who has been swamped by real-life invaders - an army of jellyfish. Dozens have been washed up on Newton Beach near Porthcawl, Bridgend, a location used for the sci-fi series. The moon jellyfish were discovered by a member of the public who was walking his dog on the beach. Council officials have warned people not to touch the creatures, which deliver stings from their tentacles. Dog-walker James Palmer, 38, said: "They looked so unnatural just washed up on the beach, especially because Doctor Who has been filmed around here. "They look straight like they're out of science fiction; moon beings sent to earth!" A Bridgend Council spokesman said: "Moon jellyfish can deliver a mild sting although they are not particularly venomous." "Jellyfish should never be touched with bare hands. "If you need to turn one over so it can be identified, always use a stick or arm-length rubber gloves. "A jellyfish sting is delivered by its tentacles, so be wary and make sure to keep your face and any exposed skin clear. "Anyone who suffers a severe jellyfish sting should seek medical attention." The coastline between Porthcawl and Southerndown has been used as a location for a number of Doctor Who scenes, doubling as a Norwegian fjord and foreign cliffs.